Description: Eastbound Grain Train on track one with a rent a wreck trailing as they pass underneath the MP 211 Pennsy Signal Bridge. Description: Working on the IT tracks to Help swicth ADM. Description: Shades of days gone by. 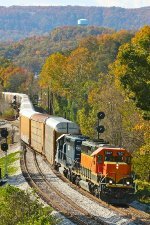 2 leased motors pull CSX train #L211 out of Wauhatchie. Description: 2 Rent-a-wrecks pull L211 Southward out of Wauhatchie. 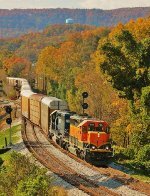 Description: The two HLCX's work their way home, and this time with CSXT hoppers to boot. Description: A very interesting consist switches Eola Yard with M-BRCKCK.